First system to arrive in Norway. 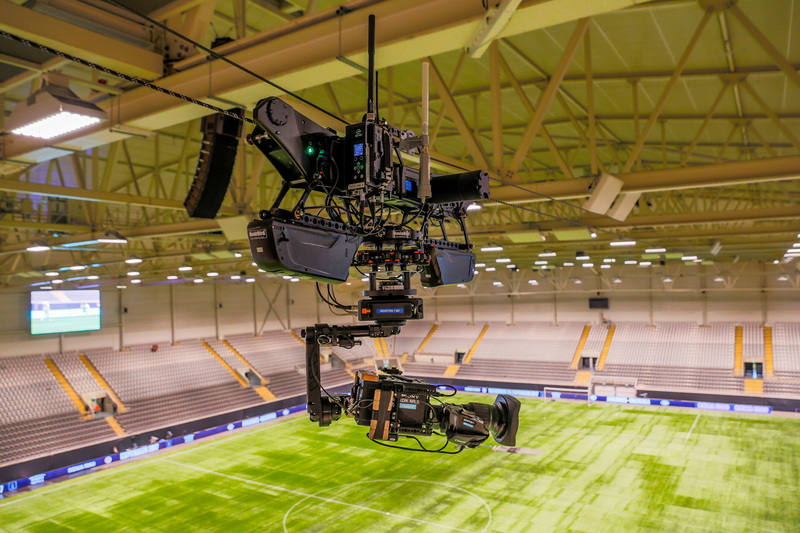 DEFY Dactylcam Pro is engineered and designed for broadcast, live events , tv-drama and feature film productions needing higher capacity payloads, but handels like a lightweight system. The Dactylcam Pro is equipped with redundant safety features and an intuitive digital platform for programming custom settings for any application. Operating from the PULSE controller allows GPS tracking, speed settings and redundant safety features that make the Dactylcam Pro the most powerful, safe and intuitive cable-cam available. Moviebird Norway has worked closely with the DEFY engineers in the US and UK to adapt the Dactylcam Pro for our needs regarding power and flexibility. Capable of payloads up to 100lbs/45kg and speeds of 35 mph/56kmt. Incline up too apx. 10 degree, depending on the payload weight. Integrated power output for accessorize: 48volt, 27volt, 24volt. 14,8volt. 5/16” 12,000lb/5,443kg breaking strength Dyneema line provided for durability in harsh conditions. Kit fits in (2) Pelican cases with custom dividers and compartments for all equipment.